Belarus’ banks have dropped further in their ratings as a result of government policy that has led to a very low level of liquidity in their transactions. The state has downgraded its asking price for their controlling share of the MTS mobile company in Belarus in hopes of finding a buyer and two Belarusian military instructors were killed in Yemen for reasons unknown. A recent report released by human rights groups in Belarus says that workers' rights to reasonable work schedules and voluntary labour are routinely being violated by the authorities. A young Belarusian journalist wins an international award for her report on a young Belarusian homosexual. A Catholic priest accused of committing treason against Belarus was released but is not allowed to leave Minsk while the investigation continues. All this and more in this edition of the Western Press Digest. State looking to sell its shares of mobile carrier, lowers price – Reuters reports that the Belarusian government looks to sell the entirety of its 51 percent controlling stake in a Russian-Belarusian mobile company joint venture, and has lowered its asking price. Previously Belarus had sought $1bn, but now has downgraded this amount to $863m, hoping to attract a buyer. MTS, the mobile company which holds the remaining shares, has not made it clear if they are interested in buying the stock or not. The previous price was too high, according to Reuters. Belarusian Banks receive B- rating, but economic crisis not imminent – The Fitch credit rating agency has downgraded Belarus’ banks to a B- rating due to broader economic issues including higher interests on loans which has led to lower demand for them. In the report, re-published by Reuters, Fitch notes that while the economy is having issues, it was able to successfully avoid a sovereign default in 2011 through careful revaluation of its own monetary and economic policies. The banks have regained some of their clients faith and, as a result, it has seen a steady increase in deposits. In general, the Banks are too constrained to act appropriately in times of economic duress and are at the mercy of government decisions, making them unable to effectively use their shareholders to deal with their issues. Authorities continue to oppress LGBT community – Radio Free Europe/Radio Liberty reports that while homosexuality was officially decriminalised in Belarus in the early 1990s, government officials continue to violate members of the LGBT community’s rights. When head of GayBelarus, an LGBT NGO, tried to officially register the organisation in Belarus, the authorities responded by routinely harassing him and reportedly making threats against him and his family. RFERL also noted that another prominent LGBT rights activist had received harsh treatment from the authorities, even being pulled out of a hospital to be beaten by the police. Both have since left Belarus, though hope to return in the near future. Belarus routinely violates workers rights – According to a report put out by the International Federation for Human Rights and the Vyasna human rights centre, RFERL is reporting that Belarusian authorities regularly violate workers’ rights. The report discusses forced labour workdays, the absence of any mechanisms to report harsh working conditions and student labour as some areas of particular concern. Young Belarusian Journalist Wins German Media Development Award – Belarusian Journalist Volha Malafeyechava received the German Media Development Word in recognition of her story about the life of a young male homosexual. In her interview with Deutsche Welle, Malafeyechava states that she decided to write the story because of the pervasive silence on the topic of homosexuality in Belarus. While her work did not receive national coverage, it did provoke negative feedback from local readers. The young Belarusian journalist maintained that good journalism is important both for changing international perceptions of Belarus and solving domestic issues. Two Belarusian Military Instructors Killed in Yemen – Reuters reports that two Belarusian military instructors hired on contract by government of Yemen’s presidential security forces were gunned down in the street in Sanaa. There was initial confusion as to the origin of the two instructors, as they were initially reported to be Russian. The article notes that while there is still a strong al Qaeda presence in Yemen, this is the first incident in which someone from the former Soviet Union had been targeted. The motive behind the killings remain unclear. 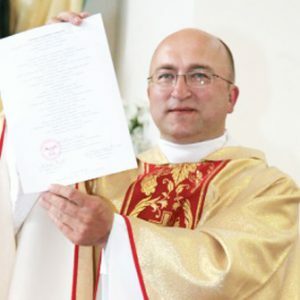 Catholic priest imprisoned for treason is released – Uladzislau Lazar, a catholic priest, was arrested by Belarusian authorities in July 2013 has been released from prison. RFERL reports that a spokesperson from state security services has received a conditional release. Lazar will not be permitted to leave Minsk until the investigation has been completed. One of the oldest Synagogues in Europe badly damaged by fire – In the western city of Hrodna, Belarus’ oldest synagogue caught fired due to a malfunctioning heating system. The damage to the Great Choral Synagogue was contained to the second floor and did not spread further thanks to the fire department’s quick response. The Times of Israel reports that the synagogue, which has a history dating back to the 16th century, was complete destroyed by fire in 1899. It was also a key site in Grodno, where the Nazis would gather its Jewish inhabitants before shipping them off to concentration camps. Lee Harvey Oswald remembered in Belarus – Voice of America carried out a series of interviews with people who personally knew the assassin of U.S. President John F. Kennedy, including with the first post-soviet leader of Belarus, Stanislau Shushkevich. The former leader of Belarus said that while Oswald already had a decent command of Russian upon his arrival to Minsk, he did not seem to have a particularly inquisitive mind. Another person who had met him said that he was rather ordinary, even boring at times. All three of those interviewed did not believe Oswald was capable of carrying out an assassination and believe that it was a conspiracy against a very normal man. Minsk continues political manoeuvring around the issue of the establishment of a Russian air force base in Belarus. Apparently, negotiations around the military facility have been not been going well for Minsk so far. In this regard, in November, Alexsandr Lukashenka demonstrated his readiness to carry out an independent defence policy. Budget constraints do not allow for any true resolution of the staffing issues in the Belarusian police. Moreover, the steady outflow of staff from the Interior Ministry continues, not only to the civilian sector but also to local police in Russia. The Belarusian military and industrial sector tries to enter the market of combat robotic systems. They have a certain technological base to be able to do so, one which is being improved despite their limited resources. The Ministry of Internal Affairs is not able to cope with the rate of labour migrants going to Russia. There have been numerous cases where Belarusian policemen have left their jobs in order to get enlisted in the Russian police force later on because of the difference in wages have become noticeable, even if these kinds of cases are not of a large-scale nature just yet. If before, the labour migration to Russia was largely police units found near the Russian border (most of the Homiel riot police moved to serve in Briansk), now the outflow from the Minsk police force has begun. Several criminal investigation officers (three from the Leninski District Department of Internal Affairs alone) work in the Smolensk police, where they are on duty every fourth day. While continuing to live in Minsk, they drive themselves in their own vehicles to Smolensk to work. The overflow of Belarusian policemen in the Russian police force is notable because their Belarusian residency prevents them from participating in the investigation of crimes. They remain foreigners and do not become Russian citizens. The fact that the management of local units of the Russian police have accepted this has led to a personnel situation in the border regions with Russia that is simply catastrophic. The result has been that the heads of various departments of the Russian police force have to employ foreigners in civil service (which in and of itself is illegal) by all possible means. On 14 November, the Commander of the Air Force and Anti-Air Defence of Belarus Aleh Dvihaleu said to journalists that the Su-27 fighters had been withdrawn from operational use because of their operational cost. Immediately afterwards, Aleh Dvihaleu announced that the Su-30 fighters were considered as a possible alternative for the Belarusian Air Force, while these planes are a modernised version of the same "expensive" Su-27 models. It is evident that the decision to withdraw the Su-27 fighters from operational use was taken on other grounds: the refusal of the Russian manufacturer to guarantee the service of aircraft and the general unpreparedness of Belarusian generals to take responsibility for continued use of combat planes in this situation. Already on 18 November, during a visit to the fighters' airbase in Baranavichy, Aliaksandr Lukashenka said that the withdrawal of the Su-27 fighters from the Belarusian Air Force was premature. 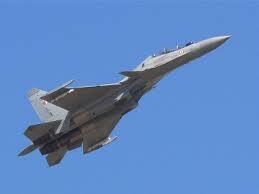 The fighters should be retained in the Air Force reserves in case of a threat of armed conflict arising. Lukashenka's participation participation at his event at the airbase in Baranavichy and the statements made there were addressed to Moscow which was in no hurry to transfer combat fighters to its ally. Even back in autumn 2012, after his talks with Vladimir Putin in Sochi, Lukashenka spoke of prospects for receiving new Russian combat jets, though these plans have obviously still not been realised. The return of the Su-27 into the ranks of the Belarusian airforce and statements about the possibility of modernisation of its arsenal, including aviation weapons, by Belarus' own means shouyld demonstrate to the Kremlin the ability of Belarus to have its own independent defence policy without increasing foreign military presence. On 14 November, Commander of the Air Force and Anti-Air Defence of Belarus Aleh Dvihaleu leaked information during a press conference that combat alert duty would be stationed at the air force base in Baranavichy and not in Lida as it was initially declared. The joint combat alert duty was supposed to start before the end of this year. At the same time, it is unclear from Aleh Dvihaleu's statement whether it was about changing the deployment site of the Russian base or simply how the combat alert duty will maintained from two bases – (he air force base in Baranavichy for the western direction and the base in Lida for the Baltic States. This change of plans for the deployment of a potential Russian base seems to be more probable. There are several arguments in favour of transferring Russian planes from Lida. First, Baranavichy has the necessary infrastructure the Su-27's operations, including an aircraft repair plant which specialises in this type of aircraft. Second, deployment of the Russian airbase in Baranavichy does not look as provocative as it would in Lida which is very close to the borders of the baltic states. However, subsequent events provide no answer to the dilemma associated with creating a Russian base. The disbandming of the helicopter base in Zasimavichy, Pruzhany district, is all but a done deal. Moreover, there are plans to deploy some helicopters to Baranavichy itself. The return of the Su-27 fighters to the ranks of the air force and the redeployment of some helicopters from the base in Zasimavichy to Baranavichy could lead to a situation where there will be no place for the Russian base there. And the establishment of a Russian air force base in Lida is politically disadvantageous for Russia as it can be perceived as a provocation by Eastern European political elites. It seems that Aliaksandr Lukashenka, after not getting commensurate compensation from the Russians for deployment of the airbase in the Belarusian territory, has decided to block the issue from moving forward for the time being. The Belarusian authorities continue to exert considerable efforts to promote domestic military products to foreign markets. In November, an agreement was reached on setting up the manufacturing of Belarusian unmanned aerial vehicles​ (UAVs) in Turkmenistan. The Turkmen orders allow for stockpiling by domestic enterprises that manufacture components for the UAVs, including their charges, while supporting subsequent research projects in this field. More than this cannot be expected at this time as procurement from interested Belarusian agencies will be rather limited due to budgetary constraints. Besides the UAVs, the domestic military industry has its hopes pinned on exports of the unmanned robotic combat vehicle "Adunok-M". Currently, efforts are under way to expand the range of weapons which can be integrated into the vechile. The export targets thus far are Turkmenistan, Azerbaijan, Kazakhstan, Russia, Indonesia, and Jordan. However, nothing is yet known about the products commercial achievements. The one deterrent to exporting the "Adunok" is the fact that it is undergoing tests and has not yet been officially added to the armoury of the Belarusian military.